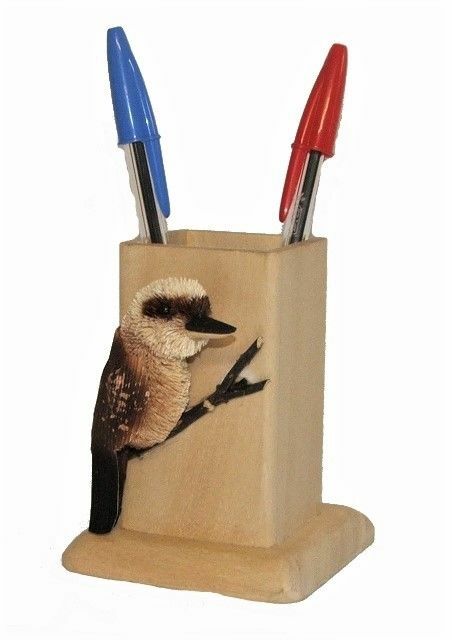 This lovable larrakin of the bush, the kookaburra will keep your pens and pencils in order at home or at the office. Made from the fibres of the Buri Palm, which is native to Asia and is also known as the Corypha Elata. 100% Natural and environmentally friendly and renewable. The team at Bristlebrush designs have always been concerned with the environmental impact of their products and as a result we have chosen to have their products made from a beautifully renewable product like the Buri Palm. The Buri Palm stalks regenerate every few months and the fronds are taken from harvested crops specifically grown for these wonderful products. All their products meet strict quarantine standards and are of the highest grade, to ensure native fauna and flora are protected at all times.